Biography of Dutch Realist Genre-Painter, Haarlem School. Gerard Terborch has the distinction of being the only exponent of Dutch painting of the 17th century with the experience and outlook of a man of the world. His particular style of Dutch Realism has a narrowness and refinement. He has a gentleman's dread of overstatement, and his oil painting, mostly executed in grays and blacks with a single flash of positive colour, are marvels of an entirely reticent emphasis. Beyond his own world he has no curiosity and makes no explorations. His genre painting portrays the world of his close companions, officers off duty and in pursuit of various pleasures. One sees the officer bargaining for a girl's favours; at his ease in a well-conducted brothel; interrupted in his dalliance by the unwelcome appearance of an orderly. This life he presumably knew at first hand and it may have been especially vivid to him, for a brother had died gallantly when the Dutch fleet invaded the Thames. These pictures imply a very simple pattern for living. It is man's function to pursue and possess, woman's function to accept the situation sensibly and gracefully to attract pursuit and reward possession. Terborch never shows any misgivings over his faith in the conquering male. He exploits the theme absolutely without criticism and with that imperturbable veracity which, two hundred and more years later, Guy de Maupassant was to exemplify in fiction. 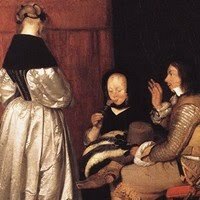 Occasionally in his later years Terborch paints women of good social class, taking music lessons, receiving visits, at their toilette. But it is still a man's world. His women are pliant, feline creatures whose charm is for man's benefit and at man's disposal. In the few conversation pieces of this sort, the early attitude has only changed to the extent that the man of the world or officer off duty is provisionally on his good behavior, remaining, after all, the same dominating and predatory male. Gerard Terborch was born in 1617, at Zwolle, central port of the Zuyder Zee. His father, an unsuccessful painter, but a widely traveled and acquainted man, had settled down to making his living as tax collector. Three marriages were blessed by no less than twelve children, half of whom developed as amateur painters, musicians, or both. The father, a man of considerable education and of ready sympathies, was proud of his talented brood, and did what he could to further their interests. There are drawings by Gerard as early as his eighth year, and really spirited sketches of skaters which he did at fourteen. At eighteen, Terborch was at Amsterdam, having earlier been a pupil of Pieter Molyn at Haarlem. It speaks for his independence that, seeing in the impressionable years the most brilliant painting in the world, the mere boy maintained the sobriety of his own handling and outlook. Before he was twenty he had visited England. Probably he painted there some of those characterful little oval half-lengths and full-length portraits which we are unable to date. Indeed, it seems that before his fifties his activity was chiefly in small portraiture. Probably he found the competition at Amsterdam too pressing, for in 1646, at twenty-nine, he went to Munster, in Westphalia, to profit by the peace conference - much as ambitious young portrait painters naturally went to Versailles in 1920. Here, he produced the extraordinary figurative painting called the Delegates swearing to the Peace Treaty (1648). The group is composed with clarity and dignity, the tiny heads have much character, the decorative character and impressiveness of the scene are well felt. Usually we feel sure Terborch practiced a gentleman's phlegmatism, but even he must have had a catch in the throat over the ceremony that ended the Thirty Years' War and gave legal sanction to the independence of Holland. He seems to have painted this grand little historical piece on his own account, and not on a commission. It is not only intrinsically his most important picture, but also one of the most instructive for its early date. From Munster, having, according to credible tradition, won the good will of the Spanish envoy, Penaranda, Terborch went on to Madrid, where he painted a portrait of Philip IV and received the gift of a golden chain. Terborch's sojourn in Madrid raises the alluring possibility of relations with the art of Velazquez, which, in its objectivity, reticence and rectitude has much in common with his own. This possibility of direct influence from Velazquez has been too summarily dismissed. Velazquez himself left Madrid for Italy shortly after Terborch's arrival, but the works of his glorious prime were readily accessible. The somewhat heavy courtliness of their accent was thoroughly congenial to Terborch, and might have taught him much. In particular, the example of a workmanship which, without calling attention to itself, gave great emphasis to the painted forms, might have been valuable to a young painter who had been influenced by the overt and almost overadvertised dexterity of Frans Hals and his followers at Haarlem. For instance there seems to be firm hints of Velazquez in the stance and compositional arrangement of the little full-length portraits of Terborch's maturity - the portly effigy of himself, at The Hague; two male portraits in Berlin; a Husband and Wife, in London; and the very sensitive portraits of Jan van Doren and his Wife, previously in the collection of Mr. Robert Lehman, New York. Something entirely undefinable in the refinement of the lighting may be coincidence, but the setting of the figures on a floor rising steeply in perspective to the actual horizon, is rare in Holland but invariable in Velazquez. The stance gains a piquancy from admitting the optical facts. Generally, in full-length portraiture the horizon is arbitrarily lowered in the interest of making a more stable base for the figure. On St. Valentine's Day of 1654, being thirty-seven years old and ready to settle down, Terborch married the prosperous widow, Gertrude Matthyssen, who lived at Deventer, twenty miles up the Issel from Zwolle. He moved to his wife's property, became a magistrate, doubtless continued to frequent the company of officers off duty, and otherwise varied the possible tedium of public service and a childless marriage by painting a few very fine pictures. He died near the end of 1681, at sixty-four, one of the most "aristocratic" of all Dutch Old Masters. It is not the range but the intensity of Terborch's art that counts. In all, the interest centres on the figures, and the setting is carried only to the point of suggesting the general character. Depth and sense of space are of minor concern to him. So is atmospheric envelopment, though it is always sensitively considered. The compositional patterns again are generally of the simplest kind, deriving from the figure in focus or the relations of the group. It is a rich and dusky world, that of Terborch. The women wear sheeny satins, or velvet bordered with ermine; the men are got up in all masculine bravery; generally a velvet table cover of crimson hue echoes the richness of the costumes. This art, which rests on the discreet use of really very simple elements, has a singularly aristocratic flavour. It seems as if Terborch imposed himself almost as much by his eliminations as by his positive assertion - just as a gentle person is almost as well known by what he never deigns to do as by what he actually does. A most characteristic Terborch is the picture miscalled Paternal Admonition. The traditional title fooled as shrewd a critic as Goethe, but a little scrutiny of the picture will show that there is nothing fatherly about the plea of the confidently seated young blade to the fine young woman with her back turned to us. Nor is the shrewd old woman drinking a glass of wine a chaperon. She is rather a referee in a business matter with amorous implications. The building of the group against the standing figure in a sort of side wise pyramid is simple, odd and very effective. The same motive is presented overtly in the Piece of Money. This time the officer is too much in a hurry to establish his winter relations to remove his corselet and change to civilian costume. He makes no pretense of courtliness, but shows a handful of gold pieces to the pretty girl who, without putting down her wineglass and pitcher, studies the offering very thoughtfully. She shows no more hesitation in considering the offer than he shows in making it. On both sides is a world where the buying of a woman's favours is entirely in the day's work. The contrast of types - the predatory male and his predestined prey - is effected without apparent emphasis. The picture is at once most concrete and a universal symbol. Of the numerous pictures of women of his own class, those with one or two figures are the best. They have a quiet and irresistible elegance of mere execution. The various Music Lessons and Concerts by Terborch all seem to me well below his best accomplishment. Perhaps the theme did not really interest him, and he tried not too successfully to give it animation. Such waiver of cool and impartial observation would be very impairing to such an art as his. We perhaps see him at his painterlike best in such pictures as Lady in her Room. It is just a view of the back of a lady clad in white satin, with the merest suggestion of a well-appointed room, but the costume tells a lot about a soft type of woman, living a life of privileged ease. More intentionally picturesque is the Concert. A woman seen from behind bows the cello, while another woman, seated behind a harpsichord, plays the accompaniment. It is a picture which, in its bright and harmonious colouring and its odd pattern, competes with Vermeer, but with only partial success, for the placing of the distant figure is ambiguous. It could be a bust on the harpsichord. Again the elaborate pattern yields little sense of space. The mere painting of the back of the cellist is at once brilliant, restrained and sumptuous. While, on the whole, Terborch shows less gusto in painting honest women than in depicting the other sort, surely one of his best pictures is the Woman washing her Hands. It is in the best tradition of Dutch genre painting. It dignifies an ordinary act without sentimentalizing it, it expresses truly and charmingly the artist's difference in attitude towards the pretty hands of the lady herself and those of the servant. The realization of a rich interior, though on a lower key, is as complete as Vermeer's, the touching off of details, such as the jug and the carved picture frames, is of a magical and entirely unpretentious dexterity, which celebrates not itself, but the object under observation. It is one of the most elaborately composed Terborchs, without any sacrifice of the simplicity of central motive, which is merely the desirability of a comely and well-groomed woman. In summing up Terbarch's accomplishment one recalls the wise saying of George Moore about a kindred genius, Manet. In substance it runs: there is nothing but fine painting in him, and it is foolish to look for anything else. This is the general truth about Terborch. Works by Gerard Terborch can be seen in the best art museums across Europe.